A choppy floor plan can restrict the usefulness of any one room. When the clients decided it was time to remodel their beloved family home, the Divine team suggested tailoring the layout of the first floor to accommodate daily life with a family friendly kitchen. The family of four had little use for a formal dining room, so the team opened up the wall between the two spaces, creating a large footprint in which to create the family friendly kitchen of their dreams. 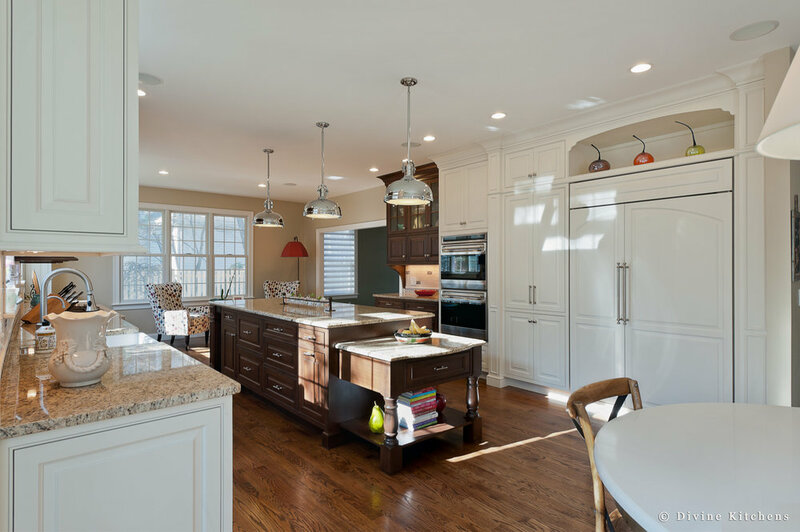 For this family, the ideal kitchen balanced functional, professional-grade cooking and serving areas with a family-friendly design for the couple’s young children, creating comfort for both the family and their guests. The clients wanted a warm, family feel to the space, while incorporating unexpected elements and materials to give the home modern appeal. The selection of a two-tone cabinetry resulted in a very custom feel, with white painted cabinetry and integrated appliances giving the room a bright appearance, balanced by the richness of stained walnut for the prep and serving areas. 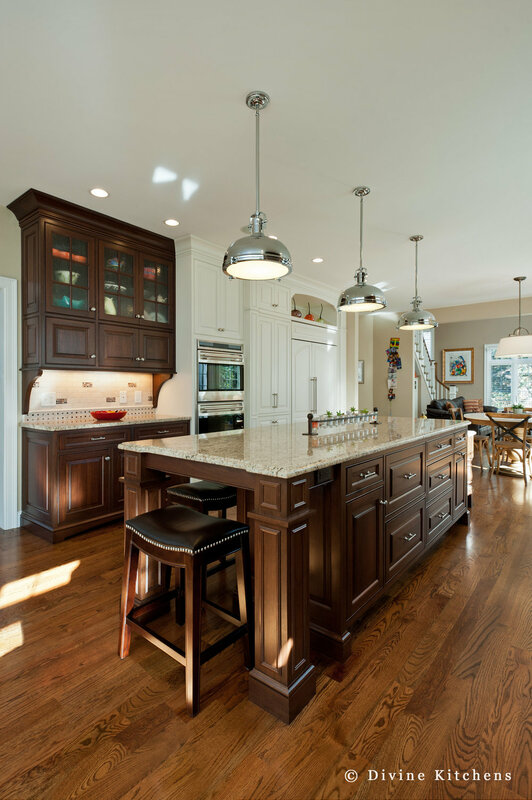 The expansive island, featuring beveled granite countertops, ample seating, and a table-height extension, give the space interest while accommodating the needs of larger parties. A colorful conversation area creates a warm, familial setting, while pulling in in the client’s favored gold and burgundy color palette. 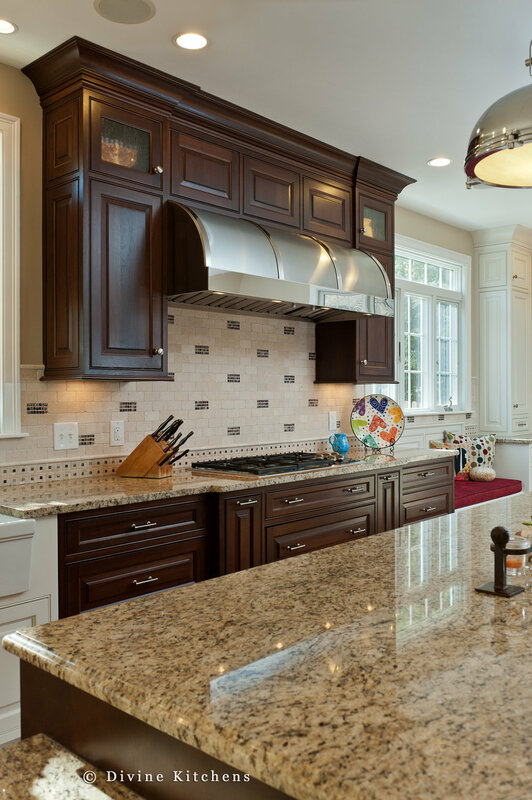 The two-tone cabinetry and color selections tie in well to the tiled backsplash, incorporating pops of deep burgundy glass tile to bring together the color scheme. One of the design goals was to create a two-cook kitchen space that allowed for husband and wife—both avid cooks—to prepare meals side by side. This area of the design started by incorporating professional elements and appliances intended for regular use. The focal point of the prep area design, the large, custom stainless steel hood vent, is functional as well—the vent area is larger than the cooking space to create drama, and increase capture for grilling and searing. The professional range, double oven with warming drawer, and large integrated refrigerator allow the two-cook kitchen to operate effortlessly, whether preparing a weeknight supper or a large family gathering. Nestled into the corner of the kitchen-still within view of all the action- the Divine team created a comfortable reading nook for the couple's children and guests to relax. This bench seat and reading nook is a quaint and comfortable space, a perfect spot for the kids to settle in with a book while mom and dad get dinner on the table, or for a visitor to enjoy a glass of wine while cooking is underway. The reading nook brings extra charm to the kitchen, and creates an inviting way to include everyone in mealtime preparations.